Have you got July 26 - 28, 2019 marked off on your calendar????? Make sure you order your BRICE FAMILY REUNION T-shirts by June 1! Shirts are available in Men's sizes in Heathered Sapphire. And Ladies and Youth shirts are available in Purple. Your order will be bagged and tagged and will be delivered to Charlene Dean. And she will distribute them at the reunion! So don't wait! 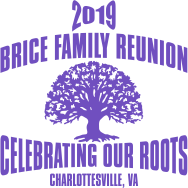 Order your BRICE FAMILY REUNION SHIRT Today!